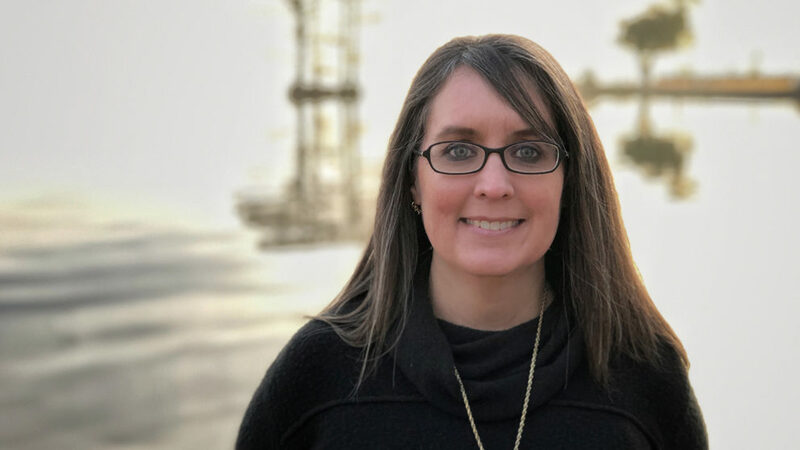 Alumna Mary-Margaret McKinney is the President and Forester at Carolina Silvics, Inc., a company that she and her husband J. Dwight McKinney, Jr., also a College of Natural Resources graduate, started nearly 20 years ago. McKinney received her BS in Botany in 1994 and her MS in Forestry, with a minor in Plant Community Ecology, in 1996. She currently lives on 22 acres in northeastern North Carolina with her three children and numerous animals. As President of a small business, I am in charge of daily operations for Carolina Silvics – from developing plant lists for sites to invasive species management plans to human resources to accounts payable and receivable. Currently, I am developing a proposal for restoration of a piedmont prairie, providing cost estimates for planting a four-mile stream restoration project, managing various hardwood restoration plantings throughout North Carolina, preparing to plant a pine research study for the College of Natural Resources, and launching a new service in coordination with the NC Coastal Federation to assist private landowners in permitting and installing living shorelines made from bagged oyster shells. I rarely get the opportunity go into the field anymore, but my employees are rarely in the office. It’s the synergy of what I do in the office with what they do in the field that makes for successful projects. I spend most of my day on the phone communicating with my employees, engineers, landowners, land managers, state and federal scientists, regulatory agencies, crew leaders, suppliers and more. I enjoy the opportunity to make a real difference in the natural communities of North Carolina for the future. It can be challenging to get engineers and state/federal departments to change project specifications when those specifications are not based on research for this region or the reasonable understanding that the natural world is not a fixed, controllable, perfect environment. Any career accomplishments you are particularly proud of? In the 90s, I helped write and develop the first Memorandum of Understanding for a private mitigation bank in the state of Virginia. With Carolina Silvics, I have had a hand in the restoration and management of thousands of acres of natural communities from Delaware to Georgia. I was accepted to NC State as a Wildlife major, but I decided before I arrived that I wanted to change that. CALS made us go to a class as freshman every Monday afternoon where a professor would come in tell us about a major. Dr. Gerald Van Dyke came one Monday to tell us about botany and I was sold instantly! How do you feel the College of Natural Resources prepared you for your current career? I use the knowledge I gained in in College of Natural Resources classes every day. What was the most important thing you learned as a College of Natural Resources student? Everyone’s opinion is valuable and there is always someone who knows more about something than you do. Find and listen to those people because they won’t always be the ones you expect. What was your favorite College of Natural Resources Class? What did you enjoy most about being a College of Natural Resources student? I enjoyed being around professors and other students who genuinely cared about the natural resources of North Carolina and their students. Did you complete any hands-on experiences? As an undergrad, I worked in the herbarium, which gave me the opportunity to see a wide variety of plants that I would not normally have come in contact with and taught me the preserving skills I would need for my graduate research when I had to collect plant samples for identification later. Keep an open mind about where your interests may take you and give yourself the freedom to explore those options. Take EVERY class that gives you more knowledge in your chosen area. You will NEVER have the opportunity to be surrounded by experts in so many fields, whose sole purpose is to help YOU. This is YOUR time to soak all of that in!